Having a good typing skill level will allow the majority of users to improve their productivity at work or studying. To improve our typing skill we will have to perform thorough training that will allow us to learn how to use our ten fingers to press the keys properly. TypingMaster provides the tools necessary to be able to type at great speed without having to look at the keyboard. This application consists in a course with 11 different difficulty levels that will show us the position of the letters and symbols on the keyboard, improve our precision and speed when typing, and even manage that we can type without having to look at the keyboard all the time. 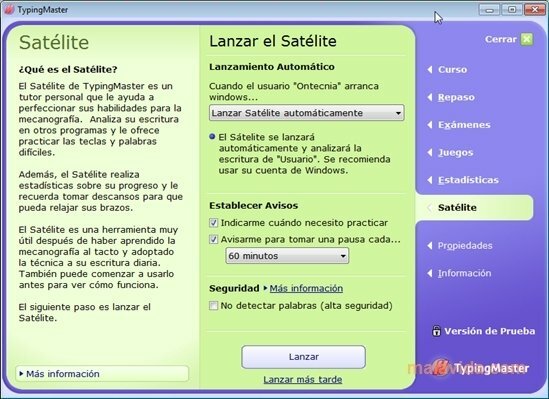 But, furthermore, it offers other interesting utilities like a “Satellite” program that analyzes the texts that we input, calculating statistics about our speed, a course to improve our strokes per minute and an advanced course to practice the numbers, the special symbols and the numeric keyboard. It also has revision exercises, exams and entertaining games like Bubbles, Lexitris and Clouds with which we'll have a good time while we practice typing. If you want to save time and increase your productivity, download TypingMaster.